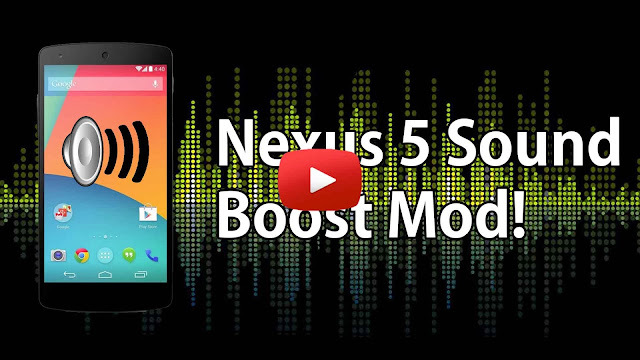 Volume Boost Sound Mod for Nexus 5! Speakers and Headphones ~ AndroidRootz.com | Source for Android Rooting, ROMS, Tricks and More! The Nexus 5 is currently one of the greatest devices out right now, but it clearly lacks when it comes to how loud the speakers and headphones can play compared to other major flagship phones. Luckily for us, Drummerjed and ZeroInfinity from XDA have created a simple flashable zip to easily boost up the volume on the Nexus 5 for both the speakers and headphones. In the video above I demonstrate the difference with and without the mod. The microphone doesn't do a good job to show you the improvements, but take my word for it! You have a couple of options for the volume boost mod. You can flash a zip file that boosts both the speakers and headphones, only the headphones, only the speakers, or go back to stock volume sound settings. Follow the quick guide below to boost your Nexus 5's speakers and headphones! Note: Your Nexus 5 must be rooted, if your not then follow this guide first! 1. Download and transfer your preferred sound mod zip file to your Nexus 5 using the links below.